So … you have the slots dadoed and the Dutchmen shaped and trimmed to a perfect fit, all 14 of them on the port topsides in our 1946 Chris-Craft Brightside U22. That Thixo Wood 2.0 delivers incredibly strong bonds seals the deal for us. But how are all those Dutchmen secured in place while the epoxy cures? Standing before you is the broad, smooth expanse of the U22’s port topsides. The bottom paint has been applied and cured. These Dutchmen must be clamped tightly into their slots for a permanent repair. I will ask again, “But how? Ever resourceful, John released selective bungs and fasteners around each Dutchman and then reached for paint stirring sticks and longer #8 wood screws. 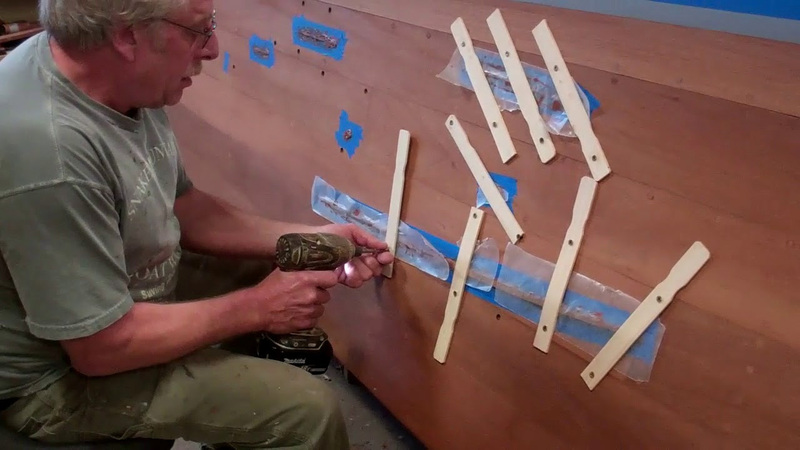 As you see in the clip, after he carefully masks the topsides around each slot, John applies the Thixo Wood 2.0 to the Dutchman and drives it home with a rubber mallet. He then secures each Dutchman with a series of “stitches,” having first placed a sheet of wax paper between the Dutchman-epoxy surface and the wood paint sticks. The repairs are allowed to cure for at least eight hours, at which time all the stitches are removed. New silicon bronze screws are driven home and bungs are glued into the countersinks that were released for stitching purposes. With the wax paper released, John will next carefully chisel each Dutchman, which are fabricated to be proud of the topside surface, until it is fair with that surface. Now final sanding can begin, followed by flipping her upright. Once we have stripped the decks and covering boards, bleaching, staining, sealing and, yes, varnishing (!) will follow. For now John still faces executing five or so Dutchman repairs on the starboard topsides. In the end, though time-intensive, insisting on using a Dutchman strategy, allows us to save every plank on her topsides, transom, decks and covering boards. Every plank that someone replaces is a bit of originality and history lost forever. We save old wood boats rather than transforming them into new “old” boats.